I’m planning to include a few of my favorite vanilla sugar cookies with each bottle of vanilla extract when I give them to my foodie friends who bake. Like the vanilla sugar, making vanilla extract is a process of assembly rather than one of cooking. I split six vanilla beans and put them into a one-quart mason jar. I added two cups of vodka, pushed the beans down so that they were submerged, put the lid on the jar and put the jar in a dark corner of the pantry. I’ll bottle and label the vanilla extract, along with a piece of vanilla bean just before Christmas. 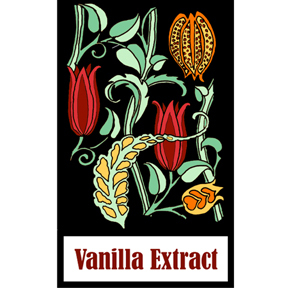 Click here to download a label for bottles of vanilla extract. When I make only one jar of vanilla sugar, I get a vanilla bean in the spice aisle at the market. But one vanilla bean costs about five dollars and I needed ten beans to make six jars of vanilla sugar and sixteen ounces of vanilla. Luckily, I found Beanilla.com. It is a source for eight varieties of vanilla beans that are significantly less expensive than those bottled individually. I got a bit carried away when I ordered vanilla beans but I love the intoxicating scent of vanilla that has filled the house. My next project is to try to make a bottle of brandy-based vanilla extract. I’ll let you know how that turns out.